Bhaktapur: Durbar & Taumadhi Sq. 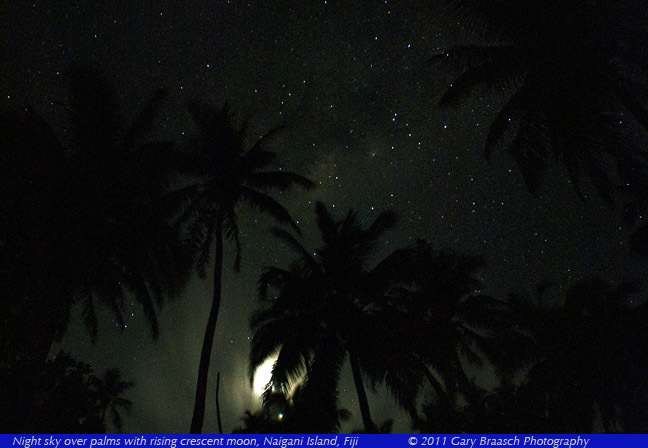 Gary Braasch was in Fiji for a few weeks early in 2011 while on a mission for World View of Global Warming, documenting climate change and environmental issues in the South Pacific. While there he was priviledged to visit schools and villages. 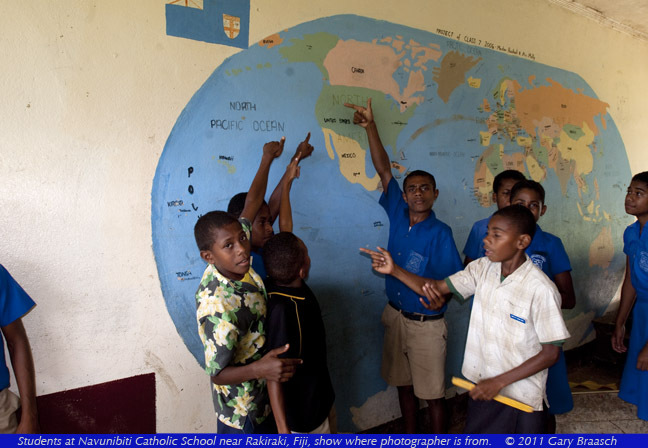 Here at Navunibitu catholic school south of Rakiraki on Viti Levu, to which Gary Braasch donated a text book, boys knew where the photographer was from. 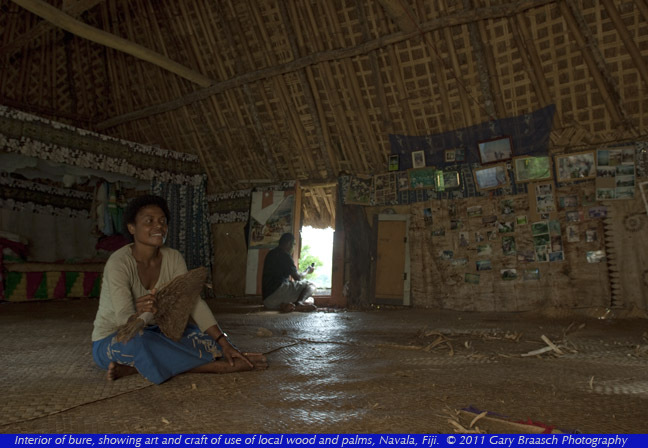 Navala, in the highlands of central Viti Levu, is a village of 700 people which decided to continue to live in the traditional and artful wood, bamboo and thatch bure dwellings of Fiji. Most other villages have changed to wood homes with corrugated metal roofs. The traditional village appearance here in the most picturesque setting amid cliffs carved by the Ba river has made this a prime tourist attraction. 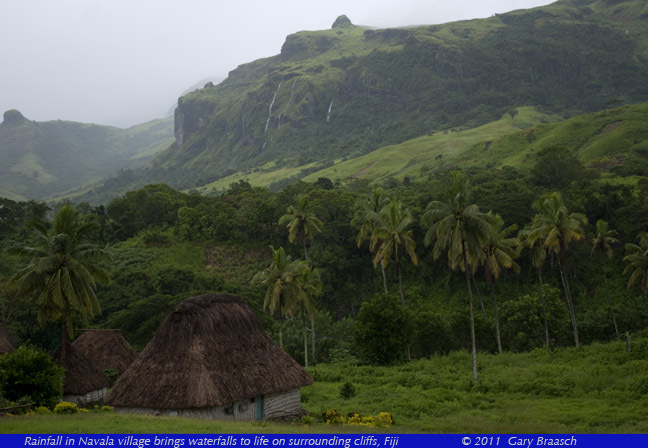 When Gary Braasch was there in March 2011, in cooperation with the PACE program at University of the South Pacific, rain had filled the river and created many waterfalls. Inside an artfully crafted bure in Navala, Mere Saunivalu talks about her family in the village, and one of her sisters who lives in Sacramento California. At the door, her husband makes a cell phone call. As in many places in the world, the cell phone has revolutionized communications here, but the village has so far not had electricity. It is planning soon to accept a powerline from the national grid. The family sleeps and gathers in this bure, but cooks and eats in a separate small kitchen building. 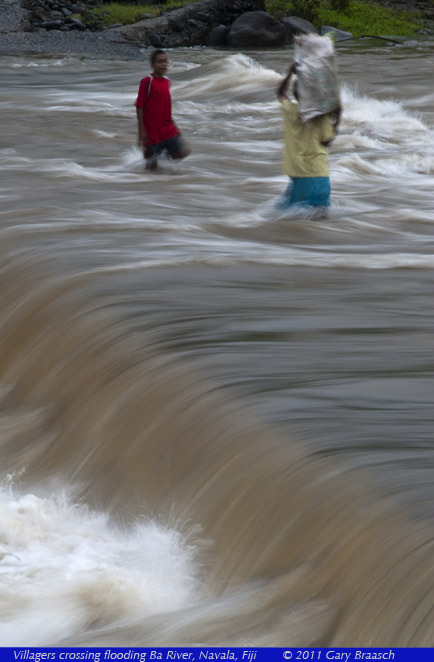 Farmers carrying a bag of produce wade across the fast flowing Ba River at Navala, Fiji. The road connecting Navala with the King's Highway near the city of Ba crosses the Ba River or its tributaries many times in this mountainous region and is periodically blocked by flooding. During dry periods the river flows through the low concrete bridge. Workers, merchants, farmers and schoolkids are dependent on a local bus connecting to the Kings Highway, Rakiraki and Nadi. In the small village of Barotu on the east coast of Viti Levu, Fiji, Kevurlli Vunisa looks over his colorful garden. 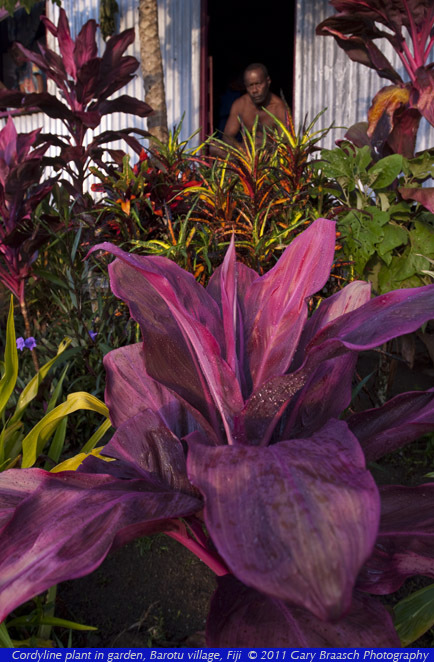 In the foreground is a purple cordyline plant, seen often in home plantings in Fiji. Gary Braasch visited Barotu with the cooperation of the PACE program at University of South Pacific in Suva. See more images on World View of Global Warming. 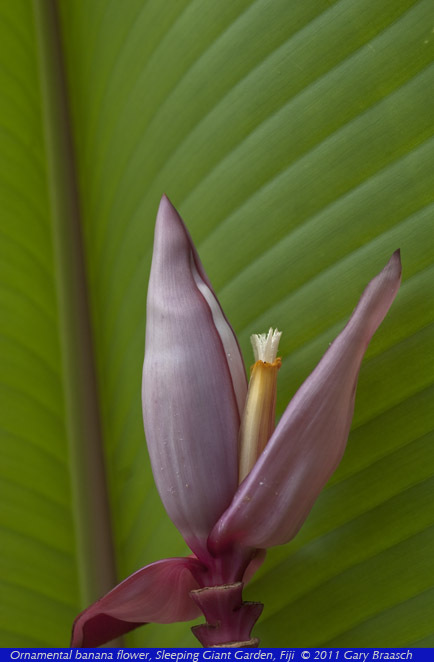 Flower of an ornamental pink banana, at the Garden of the Sleeping Giant near Nadi, Fiji. This 20 hectare botanical garden was established in 1977 by the late Raymond Burr, star of Perry Mason and Ironside, to house his private collection of tropical orchids. The gardens have developed into a popular attraction, with hundreds of species of orchids, tropical plants, trees and flowers. 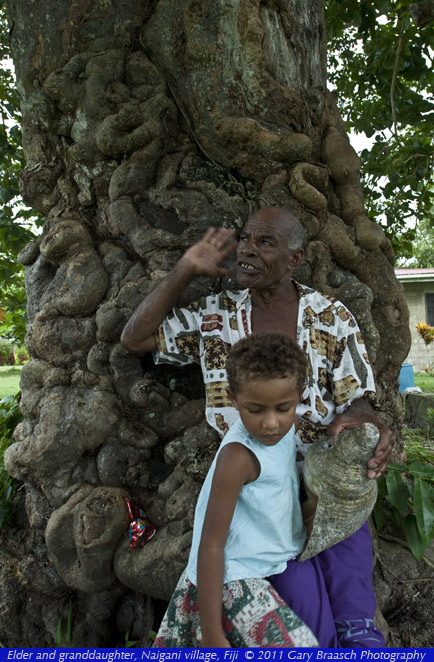 An elder of the village on Naigani Island, Fiji, gestures as his tells about how the conch shell is used to call villagers to meetings and special occasions. His granddaughter plays on his lap. Naigani is a tiny island off the east coast of Viti Levu and north of Ovalau which has only a single village and resort at which many villagers work. In the Maneaba (meeting hall) of Naigani village, the elder shows visitors a piece of Masi cloth made of mulberry paper and a whale's tooth necklace. 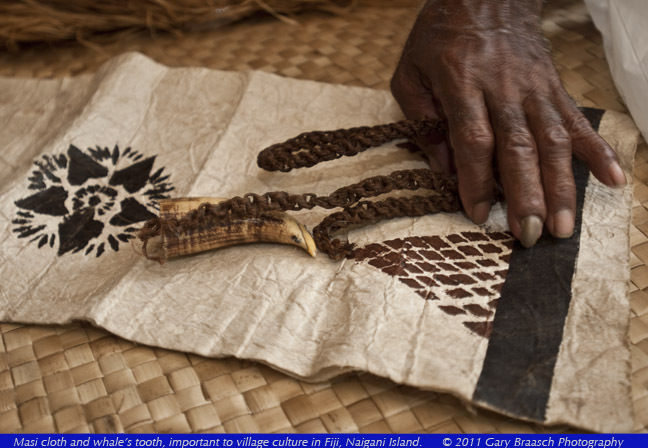 Masi, also known as Tapa in other South Pacific islands, is an ancient art of paper-cloth making and artistic dying and painting. 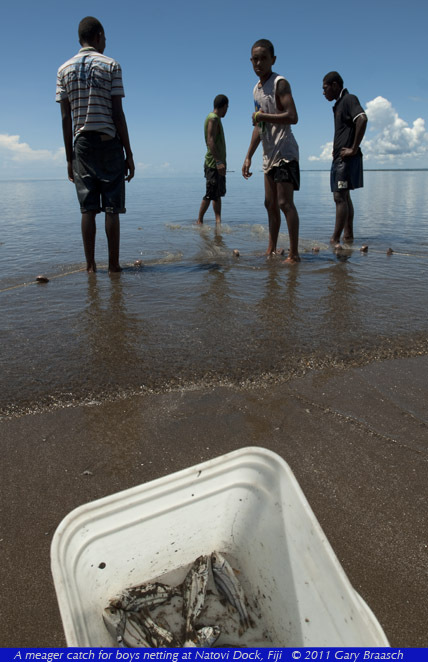 Teeth from the sperm whale, called tabua, are very central cultural items in Fijian society. They were given as gifts to chiefs, and also made as presentations in marriage. It is featured on a Fijian coin. 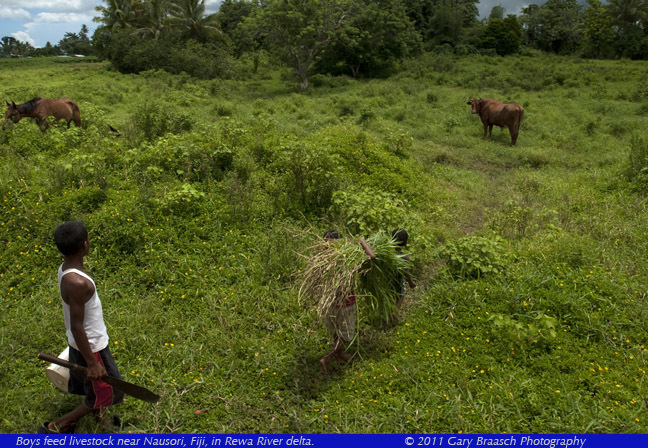 Boys carry cut grasses to feed a cow and horse in a meadow south of Nausori, Fiji, in the Rewa River Delta. 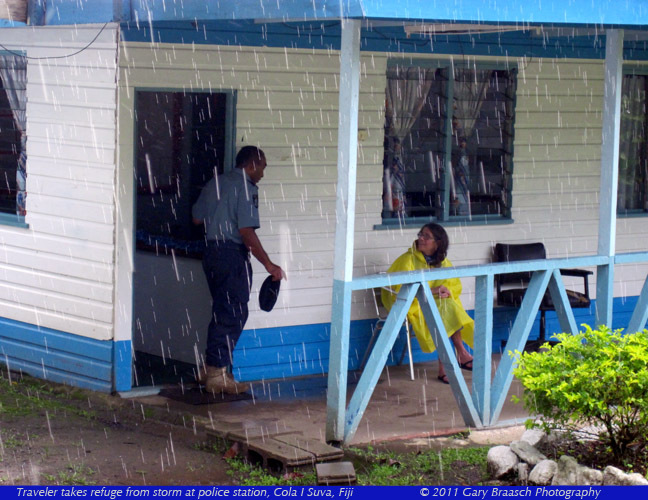 A traveler from a nearby lodge seeks refuge during a rainstorm, and a policeman comes out to offer hospitality, along the road from Nausori to Suva. The area, called Colo I Suva, is well known for a rainforest reserve and the Raintree Lodge, an ecological hotel near the forestry office. Most boat owners in the South Pacific keep good care of their important craft and often paint them in regional patterns. 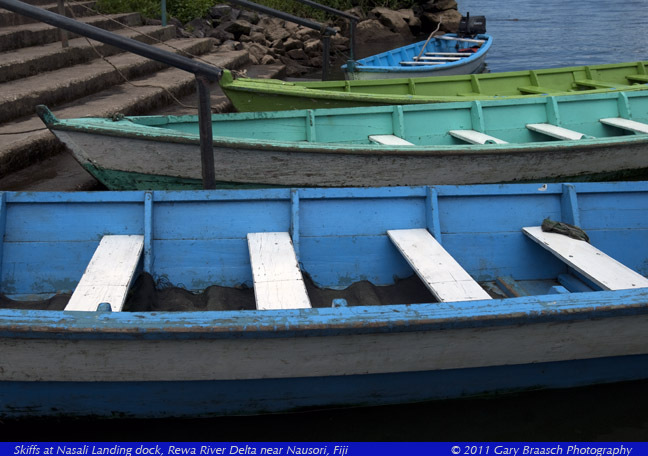 Here in the Rewa River Delta south of Suva, Fiji, one pattern was strong colors with white seats. 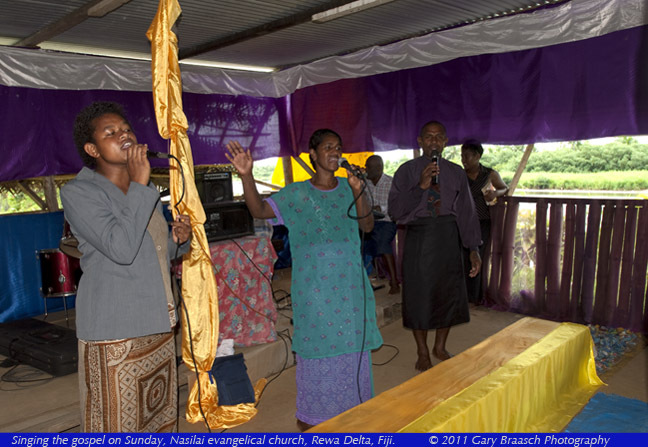 In the evangelical Christian church in Nasilai village in the Rewa Delta of Fiji, the pastor's wife (center) sings with others during Sunday service. During the sermon on this day when Gary Braasch was welcomed to the church, many in the congregation followed along with the pastor in the books of Genesis and Matthew. 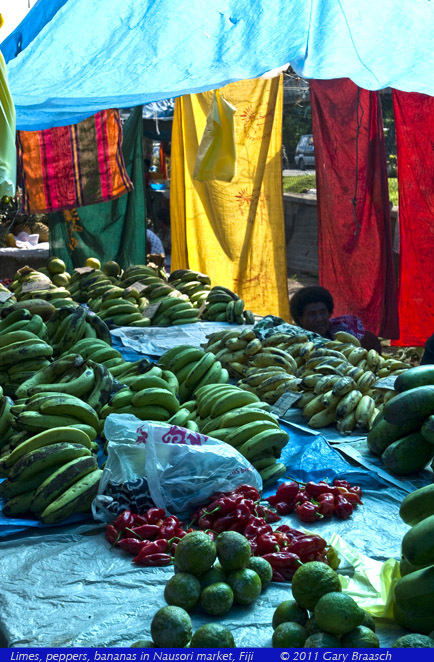 The blue tarps protecting merchants and food from both sun and rain throw a strong tint across fruit in the Nausori, Fiji, public market. Fiji has a population which is more than 40 percent Indian, and in many towns the influence of Indian culture is strong and visible. 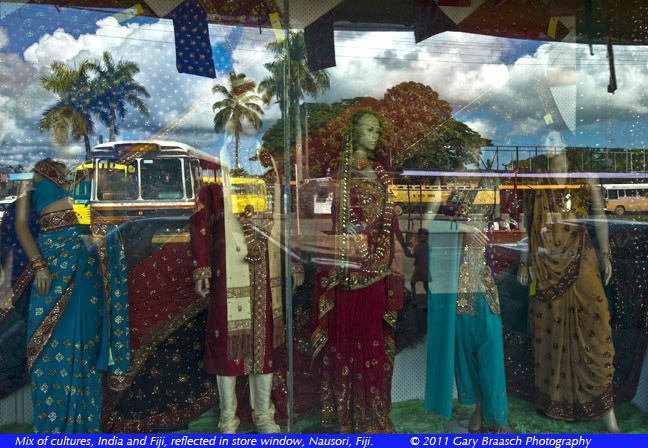 Here in Nausori, a window of a clothing store specializing in Indian styles reflects the busy bus station across the street. The southern sky is a wonder, especially to visiting northern hemisphere natives, because it is so full of stars compared to the northern sky and there are fewer large cities to throw up obscuring light.